Armscor is one of the largest ammunition and firearms manufacturers in Asia. Located in the Philippines, Armscor produces an average of 200,000 firearms and nearly half a billion rounds of ammunition annually. Most of this is exported. 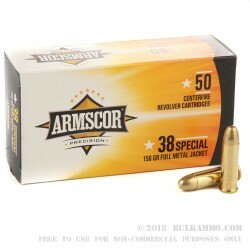 Over the past decade Armscor has become a popular brand here in the USA and is gaining a solid reputation for dependability, quality and exceptional prices. 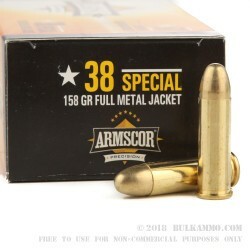 This .38 Special full metal jacketed ammunition is ideal for use in a .38 Special revolver and is designed for training, and target shooting. 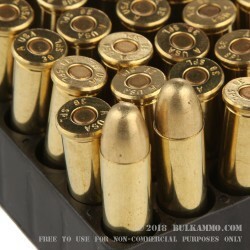 This ammunition is all new production with virgin reloadable brass. These rounds are Boxer primed and fully reloadable. You can expect a muzzle velocity right around 900 feet per second with a muzzle energy of nearly 300 foot pounds. Excellent range ammo great price. Q: Can you shoot .38 out of a .357? It might be a little easier to shoot for a beginner shooter. A: Yes, .38 Special can be safely chambered and fired from .357 Magnum firearms. A: .38 Special is the only ammo that should be fired through a .38 Special revolver. 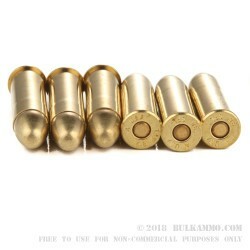 We carry .38 jacketed and solid copper hollow points. Look for JHP, SCHP, or SJHP acronyms.